Education Secretary Justine Greening has announced a £23m fund to support bright children from poorer backgrounds in England whose talent might otherwise be "wasted". The aim is to reverse a trend in which bright poor pupils are overtaken in school by less able wealthier children. 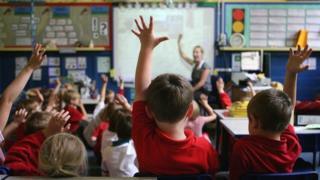 It is part of a new Department for Education social mobility strategy. Labour's Angela Rayner said the plans were "rhetoric" against a background of funding cuts and lower real-terms pay. The Future Talent Fund, drawn from existing Department for Education budgets, will test new ways of supporting the most able youngsters from deprived areas. There will be a tendering process for ideas to tackle the problem of poorer youngsters who show great ability when they begin school but who do not fulfil their potential. The proposal is part of a new social mobility plan for education, called Unlocking Talent, Fulfilling Potential. Ms Greening said the "overarching ambition is to leave no community behind" - and to make sure that opportunity is spread more fairly across the country. "Where you start too often decides where you finish," she told an event in London organised by the Reform think tank. The education secretary highlighted the importance of a good start in children's early years, with £50m reallocated to support the opening of nurseries in areas without enough childcare provision. Ms Greening warned that too often if children fall behind in the first years of education they might never catch up - and could face a "whole lifetime of missed opportunities". She also called for better help to get people into good jobs - particularly from disadvantaged families who "lack the networks, the smart advice, the confidence that employers sometimes look for". The government's commitment to social mobility has faced criticism. Earlier this month, the board of the Social Mobility Commission resigned in protest at the lack of progress. And on Wednesday, the Office for National Statistics published figures showing wage stagnation, with average wage increases continuing to fall behind inflation. Labour's Lucy Powell, who sits on the education select committee, said with wages not rising, unaffordable housing and job insecurity, social mobility seemed to be going backwards. "It's hard to see how life is not getting harder," she told the conference. But Sir Kevan Collins, chief executive of the Education Endowment Foundation, said social mobility now depended on where you were born. In London it could be a real possibility, he said, but in other parts of the country it remained a "complete fantasy". He called for better interventions in the early years and better options for post-16 year olds who were not going to university. Teach First's Sam Freedman said the most important challenge was to improve the supply of teachers. He said the shortage shortage was "causing real problems on the ground". The leader of the National Association of Head Teachers, Paul Whiteman, backed the plans for a more "joined-up" approach, with schools' efforts to "narrow the gap" being linked to businesses, employers and local community initiatives. "The issues that underpin inequality reach far beyond the school gates and exist throughout the communities that schools serve," said Mr Whiteman. Prof Les Ebdon, director of Fair Access to Higher Education, also backed the plans. "Talent is found across the country - from council estate to country estate - and ensuring that your postcode doesn't act as a barrier to your potential must remain a top priority," he said. But Labour's shadow education secretary, Angela Rayner, rejected the government's promises of social mobility, saying that they were contradicted by their decisions on funding. "Ministers have slashed funding for Sure Start, cut school budgets by £2.7bn, imposed real-terms cuts on teachers' pay and abolished the education maintenance allowance which has made it harder for those from disadvantaged backgrounds to stay in education," she said.